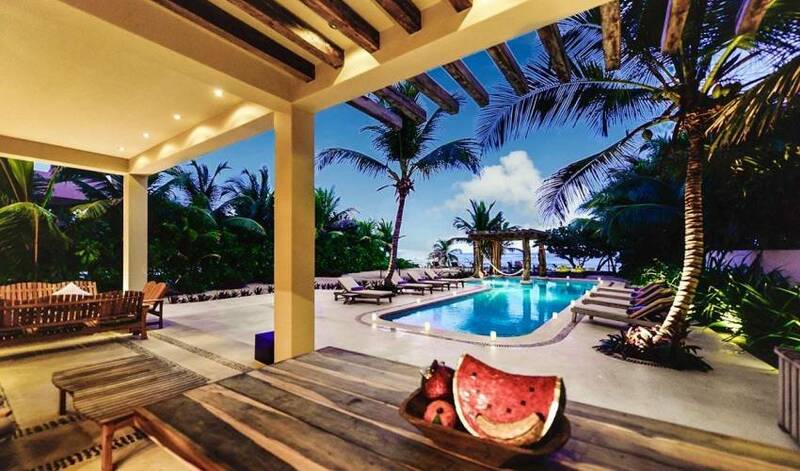 This magnificent beachfront villa is located on the prestigious Jade Beach, an exclusive area south of Akumal. Considered to be one of the finest villas along the coast, this upscale home is exceptionally spacious, boasting thousands of square feet of luxurious beachfront living. 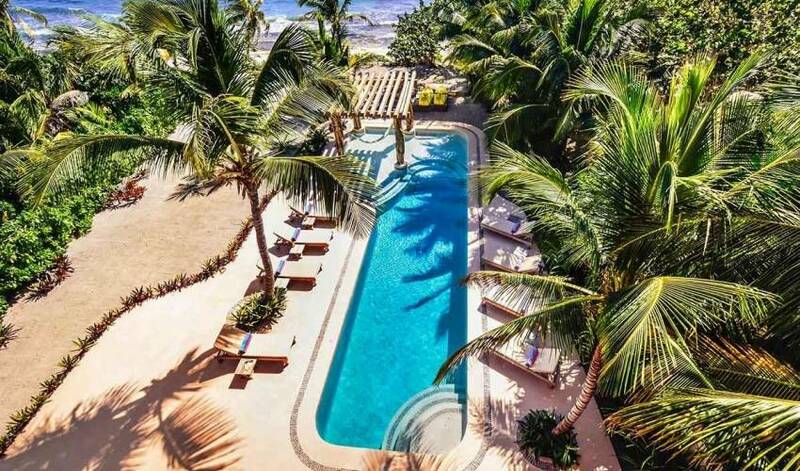 The villa has direct beach access where you can have hours of fun with the villa’s kayaks, and there’s amazing swimming and snorkeling on a section of Jade Beach near the property. The sunsets and sunrises at this villa are spectacular! Chess enthusiasts will love the side table fashioned into a chess board with Mexican figurines depicting the knights, queens, rooks and other pieces. The inviting pool is perfect for swimming laps, or relaxing in a hammock with a good book under the grand hardwood pergola. 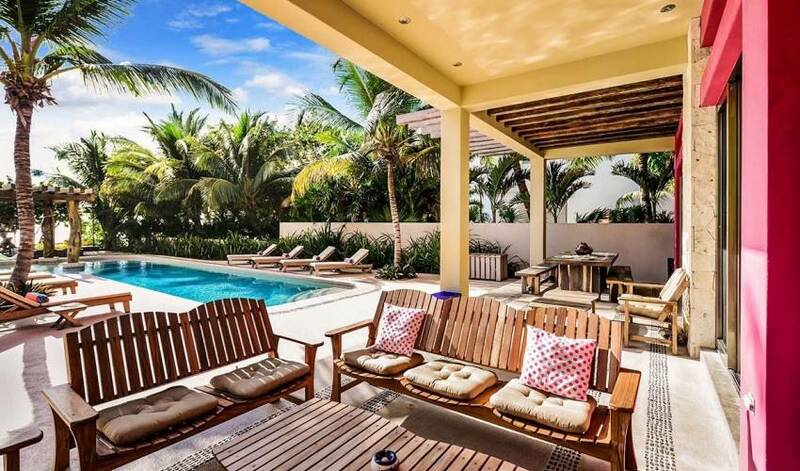 Chaise lounges flank the swimming pool as well as an outdoor shower and seating area. The stairway with waterfall feature leads to a studio with sofa and large flat screen TV. 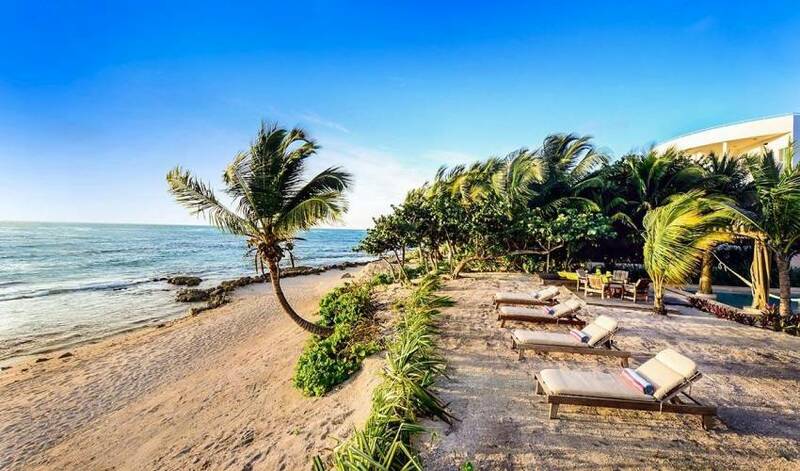 Kids and adults alike will want to poke around the rocks on the beach right in front of the villa; for swimming and snorkeling, walk a few steps to a section where there’s more soft sand. The sliding doors on the ocean side of this gorgeous villa ensure that the expansive open-plan first floor is always bright and airy. Slide open the doors and let the Caribbean breeze in. 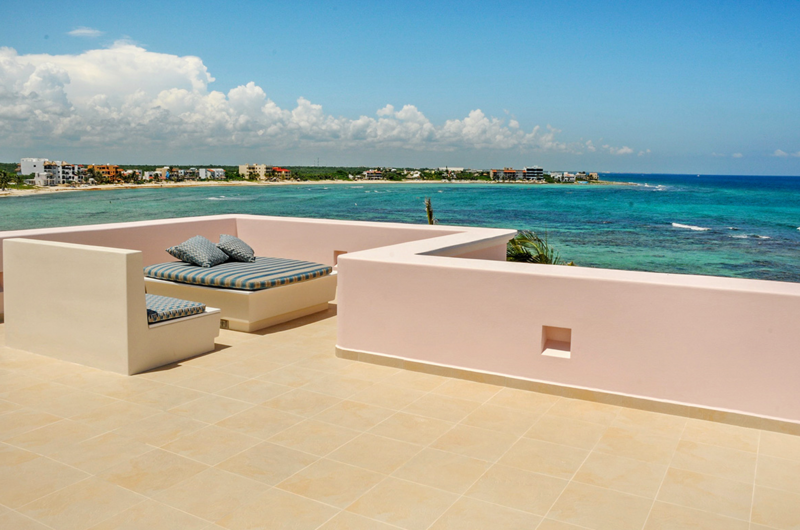 The large sofas in the living room invite you to sink into their comfortable cushions and relax while perusing through one of the colorful coffee table books on the local Mayan history. The gourmet kitchen has beautiful Brazilian granite with a central island and a breakfast bar with six high top chairs. All bedrooms are individually furnished with luxury linens and have wide balconies with seating to provide direct views of the Caribbean ocean. The master bathroom has the most extraordinary feature: two showers in the same large cubicle, one of which has no ceiling so it allows you to shower while looking directly up at the sky! 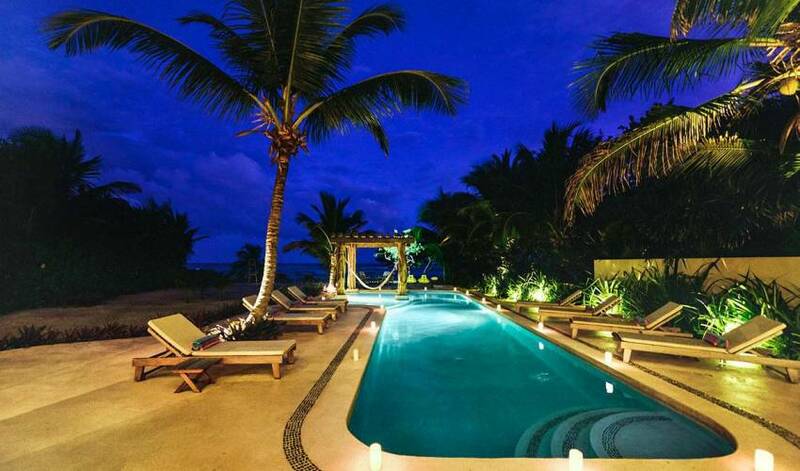 With four bedrooms this villa can accommodate up to eight, plus four children. Enjoy spectacularly colorful design and amazing beach and jungle views here. 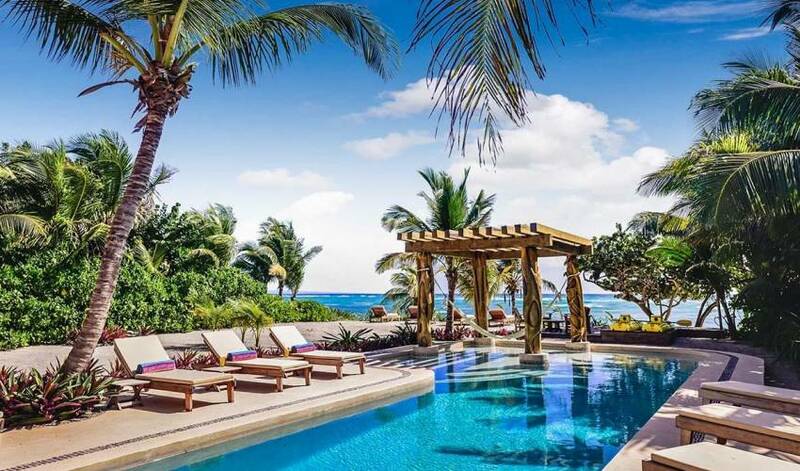 Relax in your beachfront hammocks or just enjoy a cool drink by the pool. 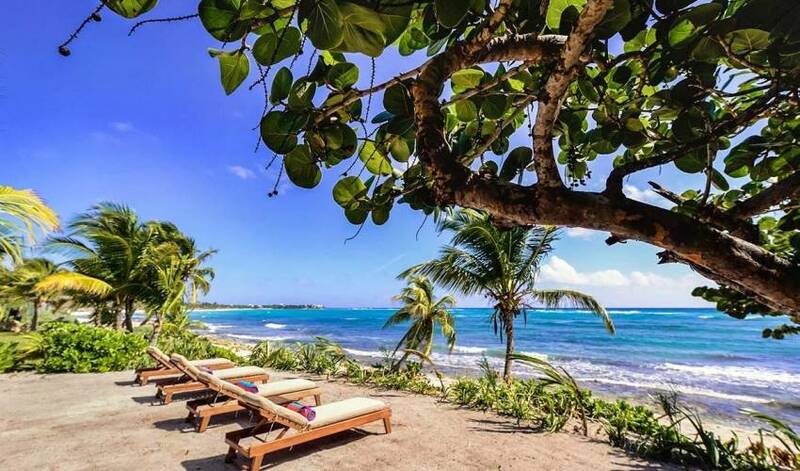 Offering endless options to enjoy the magic natural environment in Akumal, you can go snorkeling, swim with turtles, enjoy lagoons, cenotes, natural parks and scuba diving. Your dream villa awaits!